Apartment Rentals: Aegis Two Apartments Apartments, Pullman, WA: description. The Aegis Two Apartments features 20 affordable, attractive one-bedroom apartments just a fourth of a mile from WSU, Dismores IGA, McDonald's and Starbucks, and less than a mile from downtown Pullman. It's also near Pullmans Hybrid Bus System, which is free to all students and WSU employees! Both Aegis buildings are in a quiet location away from traffic. They attract serious, goal-oriented students, who tend to stay till they graduate. It's rather difficult to find a vacancy in these buildings. The living room and bedroom are large and airy; the bedroom has two large closets and an alcove for a desk and bookshelves. These brick buildings face north and south, are easy to keep warm in winter and stay cool in summer. 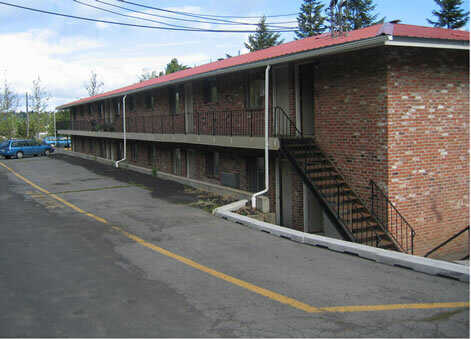 Additional features include free off-street parking, and on-site laundry facilities. Did you know? Aegis, in Greek mythology, (is) a garment of Zeus, the king of the gods, and of Athena, his daughter. A short cloak with golden tassels, generally worn over the shoulders, the aegis served as the symbol of Zeus's power; it not only protected him but terrified his enemies. Originally made for Zeus by Hephaestus, the god of artisans, it became the ordinary dress of Athena in later mythology. In art, Athena's aegis was frequently depicted as a breastplate or as a shield fringed with serpents. The garment was also occasionally used by other gods. (Encarta). It is so that The Aegis Apartments are perceived as a mighty cloak of protection against the elements -- the solid brick walls providing real cover from inclement weather.